Oy. If I had a nickel for everytime I heard of someone wishing they’d done something differently when branding their business, I’d be rolling in money! Branding a business is not for the faint of heart, and sometimes professionals can even get it wrong. Your brand is the face of your business…the first thing clients see when they visit your website or you hand over a business card, and the first impression you’re giving could mean the difference between converting that stranger into a client and never hearing from them again. There are a few mistakes that are made more often than not, and whether you’re getting ready to start a new branding venture for your yourself, or you are hiring a professional, these are some important things to keep in mind and NOT to do! 1.) Re-branding too often (or not enough) | Eight years ago, when I was a brand new wedding photographer, I was also a brand new graphic designer. The idea of creating a brand “voice” never occurred to me, so I was rebranding every month. EVERY. MONTH. I thought it was cute to brand for the season or the holiday *insert eye roll here* . Case in point, I remember one specific “logo” I sported included snowflakes simply because it was winter. This is so wrong on so many levels. Creating a voice with your brand and sticking to it is imperative to building familiarity with your company. When you think of big companies such as McDonalds or Nike, you’re mind is immediately brought to the golden arches and the big check mark icon without even seeing the company name. You want people to be able to recognize your company without having to think about it. However, the biggest reason is that rebranding too often is a no-no is because it promotes a feeling of unprofessionalism. Because your brand represents the vibe of your company, the type of client you want to attract, and your overall professionalism, it confuses peoples if you rebrand more often than every 3-5 years. A refresh is needed every so often, but too often can make it seem as if you don’t know who you are or what you want to represent, and if you don’t know who you are, how is a client supposed to know who you are? Seriously, who was I trying to be with those snowflakes?! 2.) Branding for the wrong client | This one is huge! Who is your ideal client? When someone hires me to create a custom brand for their company this is one of the first questions I ask. I want to know specifically…who specifically is your ideal client? Where do they live, shop, and work? How much money do they make? Are they married? Do they have kids? What are 3 characteristics of their personality that attract you to them? Do they have pets? What do they like to do for fun? What is their name? These questions help you to visualize your ideal client as a living, breathing person, and that helps tremendously because your clients will be living, breathing people and putting a personality and face to your ideal client will then help sculpt the vibe of your business and therefore your brand. If you aren’t doing this exercise, it’s super easy to stray from your ideal client, and more often than not, you end up branding for the wrong client. It’s so much more than creating something pretty! If you aren’t attracting the clients you really want, it could be many things, but the first place I look for the answer is at a company’s branding! 3.) Designing your brand for you not your business | I’m going to use myself as an example for this. This one was a tough pill to swallow when I was a newbie wedding photographer. What’s wrong with creating a brand that matched my personality!? I’m fun, sassy, huge city lover, obsessed with good fashion, rarely miss the chance to browse a current issue of Vogue, and love updates from NYFW (New York Fashion Week). Issue: I didn’t want to shoot super modern, trendy, and fashionable weddings. I wanted to be a high end wedding photographer that shot authentic, timeless, and romantic weddings. Much more traditional than what I branded for. So it made sense that I wasn’t booking those weddings. Clients visiting my website assumed I shot modern, trendy, and fashionable things because that’s what I had splashed all over my site! So how do you fix this?! Figuring out a way to not lose yourself but also brand for your ideal client (see number 2 above) is essential. You can still show parts of your personality that appeal to your ideal client, but my clients don’t necessarily need to know that I love fashion week and how excited I was the first time I was in Paris and bought my first Vogue Paris (although, that was cool…so I Instgrammed it :). I’m a hopeless romantic, love old movies, I think a classic tux never goes out of style, I love to travel, and wine is my go-to drink, so these are the things about myself that are consistent with my brand and the things I play up on my website and social media. You can have both, but strategically! 4.) Inconsistent design | Consistent design is the implementation of all of these tips! Because all of these tips tie together and work better when all are done consistently together, an inconsistent design strategy can ruin a brand in the first 5 seconds of logging onto a company’s website. Multiple fonts that don’t match, colors that don’t flow, images in the wrong place, classic vibe on one page, followed by vintage or DIY on another can not only confuse your visitors and look unprofessional, but can also cheapen your brand. Short and sweet: stay consistent throughout for a more cohesive look! 5.) Pre-made logo| This one is a touchy subject. While I understand that everyone starts somewhere and starting out as a brand new entrepreneur also means not always having the funds to pay for a custom made logo, purchasing a pre-made one can do a multitude of things. First, pre-made logos are sold to more than one company, sometimes hundreds of people, so even if you find one that falls in line with appealing to your “ideal client” this means your logo will look the same as hundreds of other entrepreneurs out there! That takes away your uniqueness and what makes you special. Tying into that, if a customer is on the hunt for a local bakery to make cupcakes for their child’s 3rd birthday and sees that you have the same logo as another local baker, their impression may be that you either work for this other person, you stole their logo design, or absolutely nothing sets you apart from the other baker. Again, yet another thing that just confuses your potential client. 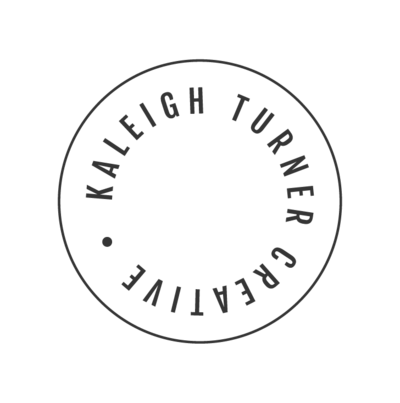 Instead, if you are just starting out and dishing out the money for a custom logo isn’t in the cards just yet, opt for a pre-made logo that is only sold once, or even just a few times, by the designer (Kaleigh Turner Creative will soon be offering these!). That way, you know you’re getting something unique and special. Then, as soon as you’re able, hire a designer to create something custom just for you! 6.) Choosing the wrong colors | One of my all-time favorite subjects to talk about is color theory or color psychology. “Color Theory” is the visual effect of a specific color combination and the idea that it can effect how people perceive your company. Did you know that the colors you choose for your design could have an impact on what people feel when they look at it? Black is seen as powerful and sleek and is often used in luxury design. Blue makes people feel a sense of security and comfort and can be seen in many banks or other businesses. Implementing the color red in a design promotes a feeling of warmth and comfort, but can also promote anger or hostility depending on the design. Red also creates a sense of urgency and is often used in clearance sales in clothing stores. Pink is often used to market to women or young girls because it’s seen as feminine and youthful. There are downfalls to the use of each color, but used properly they can have a significant impact on the overall vibe of your brand! Helping my clients choose a color or color scheme for their brand is something I take very seriously, and I always welcome questions or advice on this subject! *Bonus tip – the internet has made our huge world so much smaller, so if your social media game is not also on point, then your branding will falter. Remember: a consistent feed and relevant content are the two most important factors to maintaining a brand on social media! I’ll be posting more in depth on this subject soon! And that’s it!! I encourage you to read through this list when branding your own company and hope that it helps urge you in the right direction. If you’ve read through this list and are doing everything right, but still can’t figure out what exactly you’re doing wrong, contact me! I’d love to give your brand a critique to help you make the changes needed in order to bring in the right clients!